The GenRad 1417 Four-Terminal Capacitance Standard consists of a 1 µF standard capacitor and two precise inductive voltage dividers used to scale the value of the 1 µF capacitor up to 1 F in decade steps. This arrangement provides accuracy and stability unattainable with very high-value true capacitors. 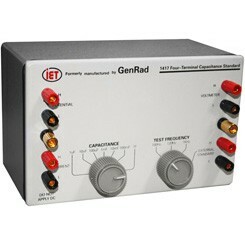 In addition to the seven direct-reading capacitance values on the GenRad 1417, an infinite number of intermediate or higher capacitance values can be obtained by using external capacitors. An external capacitor is simply connected to the 1417's external standard terminals, either directly or in parallel with a 1 μF internal standard, and the resulting capacitance is scaled in value by the 1417's inductive voltage dividers. The direct - reading accuracy of the 1417 is ±0.25% plus ratio accuracy at test frequencies of 100, 120, or 1000 Hz. Since the 1417 scaling ratios are precise and repeatable, better accuracy can be obtained by measuring the actual value of the internal 1 μF standard or of an external standard before scaling. The GenRad 1417 also serves as a standard of dissipation factor (D). The dissipation factor of the 1417 is intentionally set to 0.01 at test frequencies of 100, 120 and 1000 Hz. Basic D accuracy at these frequencies is ±0.001. The 1417 may also be used as a two-terminal capacitance standard when higher D values can be tolerated. In a two-terminal configuration, D is less than 1 for capacitance values up to 1000 μF at frequencies below 150 Hz. This feature allows the 1417 to be used in calibrating the higher capacitance ranges of popular universal or RLC bridges. One additional feature of importance is that all the 1417's parameters are measurable (without disassembly) so in effect, its ultimate accuracy depends on the accuracy of the external measurement equipment.